Synopsis: Former United Nations employee Gerry Lane (Pitt) is pulled back into action when a zombie pandemic breaks out and he is tasked with travelling abroad to find the source of the virus so scientists can create a cure. Sarah: Yeah, by all accounts the only thing this movie has in common with the book is the title. A: This was a film that we weren't dying to see but we were intrigued by it because we both like Brad Pitt, I'm a big fan of zombie movies, and we had heard conflicting things about it, so we were interested to see it with our own eyes and give our own take on it. So now that we've seen World War Z, Sarah, what did you think of it? S: I'm not one for zombie movies usually, they kinda freak me out, but I enjoyed parts of this movie. Specifically the parts that were an action movie, the parts were Brad Pitt's character Gerry had to go around the world looking for a cure to the outbreak. I liked those parts. I liked Brad Pitt! I thought he did a fine job, but there were parts of this movie I definitely did not like. So I'm kind of torn on this one. I thought it had likable parts and parts that you scratch your head at. Like I found myself wondering why they made some certain choices. But you're the zombie expert in the family, what did you think? S: Don't get a big head, I said you were the expert in the family. S: They briefly shed some light on Gerry's family. They briefly set up that he used to be a big player for the United Nations but now he's a stay-at-home dad. They briefly touch on that. A: But what I meant was that I enjoyed how they gave the film some heart so you're more invested in Gerry's activities. But as far as being a zombie movie? I wasn't so much a fan of the film's take on zombies. The zombies here are more in line with the 28 Days Later/28 Weeks Later kind of zombie, not your traditional Walking Dead or Romero zombie. They're not so much zombies here as they are infected people with a weird virus that makes them super hyper and it's transmitted via biting. A: They were brainless, really, and really more like animals than the undead. A: And a total disregard for their own safety or well-being. I remember a number of times early on in the movie where zombies were trying to get at humans in cars by smashing their heads against windows. S: And I don't know, as far as zombies go, if that's not usually the case. A: Well usually zombies aren't fast-moving and don't do things like that necessarily. So, anyways, that part I kind of wasn't jiving to so much. And a lot of the zombies early-on in the film are digital or very clearly not real actors in makeup, whereas I'm a bigger fan of the Dawn of the Dead/Walking Dead-style of zombies where it's an actor in makeup. So, getting more to the point, I'll say I enjoyed the first two-thirds of the movie. S: Yeah, I would agree, because it's SO action-packed. S: Almost from the word "go," pretty much from ten minutes in until the third act. S: To Korea, to Israel, to a jumbo jet...and from there Gerry gets to England and what do you know? The movie gets pretty boring the whole third act. A: And here's a big thing about World War Z the movie: it went through a lot of production troubles and a big part of that was that they completely re-wrote and re-shot the last act of the movie. About the last 40 minutes or so I would say. And you can tell that those last 40 minutes were written separately because the entire movie certainly changes in tone and pace. S: Yup. And it is so crystal-clear when it changes that it's almost jarring! The thing that leads up to the change is so jarring and final and abrupt...and I guess we can talk about it now because it's been out for weeks and was even in the trailer, but it's the big plane-crash sequence. When the plane lands, it's like BAM! Movie stops cold. Then it changes and turns almost into a classic, generic horrorish zombie movie. A: Absolutely. It's far more of a slow pace, it involves them being an a medical facility that has dark hallways that are filled with slow-moving zombies (why are they slow-moving now?) and they have to avoid the zombies, only arming themselves with a baseball bat and a crowbar...it's your far more classic interpretation of a zombie movie than it was before. It's no longer this action-packed film it was before...and it just doesn't work for me. A & S (in unison): Left me wanting. S: Like, I was like, "Wait a minute, that's it? The movie's done?" And a movie shouldn't leave you feeling that way. S: There is a lot of stuff that happens that's quite fortuitous for Gerry. A: Yes. So again, for the most part I enjoyed the first two-thirds of the movie, the third act I could do without. S: Here's the other thing that's lacking: for a zombie movie that's extremely action-packed, there is very, very little on-screen violence. And I think that's a shame for a zombie movie. A: Oh, agreed. It's one of the reasons it didn't feel like a zombie movie. S: Exactly! We weren't seeing zombie's heads get chopped off or bashed in. Really...you see people get attacked but it's like a zombie will lunge at somebody and they'll tumble off-screen. A lot happens off-screen, including some poignant moments in the film. When they happen, and they're happening off-screen, it kills the moment and takes away from the impact. S: Which at the beginning? I kinda liked it. When they're in Philly and they use the quick shots and there are people rushing around but then it quickly shows one zombie just standing in the crowd? That was cool, I liked that effect because you weren't quite sure what you were seeing. It made it feel like you were one of the people running in the crowd amid the confusion. Because they did a good job with the marketing, they never really showed you what the zombies looked like so you didn't know what you were looking for or what they were going to look like. A: But like later, in Jerusalem? It didn't work as well. S: No! Not at all! A: But they were also people. They weren't just CGI creations, they were actual actors in makeup, which I liked. S: Yes! And they were credited at the end, there were only like twelve of them or something, so I thought that was kind of cool. They weren't just credited as stunt-men, they were credited as zombies. S: Yeah, but none of them were in the skywalk between the two buildings. So that bothered me a little bit. S: So what do they do? Do they just rot away to nothing? Another problem I had is that the zombies aren't dead necessarily, or at least it didn't always look like it. They're infected. It didn't seem like The Walking Dead zombies to me where you get bitten, you get infected, then you die and then you come back. Or any other zombie movie really. It's a transformation that's almost instant here. So they'll have to eat to survive, because they're not eating each other. It's just a flaw in my eyes in the basic principle of the story, whether it was from the original book or not. S: I can't either. The screenwriters' interpretations here are flawed at a basic level for zombie movies. So that's just wrong. But hey, let's talk about the characters now. All of the actors that have parts, whose faces will be familiar to a lot of movie-goers. You have Matthew Fox, who's in all but two scenes; you have James Badge Dale (Iron Man 3) as a military Captain; there's David Morse (The Hurt Locker) as a CIA agent gone rogue; and who's the Roman guy? Oh, I know, the director of the World Health Organization facility is the Vatican inspector in Angels & Demons. So, some familiar faces from the movie and TV world, but in very bit parts. So having them be in the movie at all, I'm curious what you thought of having name actors like that playing such small roles? S: Oh I'm sure he had way more, his role was way too small for an actor like him. A: Well he's a big-name actor to have just one scene, so I feel like there was more to him than what was in the final movie. That's just how I think it was. Overall it doesn't bother me much, though I did think it was slightly odd at the time to see Matthew Fox as a nameless soldier, but again the film is about Gerry and these are just people he comes across. Now I do know the book isn't just about one person. There's a narrator but he's just someone at the U.N. who is kind of talking about the different tales or reports from around the globe that he's received. A: So I kind of look at it like Gerry going around the globe and maybe Matthew Fox is just one person who has his own personal storyline we just don't see, and likewise with Morse's CIA agent and so on. S: That could be. That's an interesting way to look at it. A: Yeah, so I was okay with it. It was nice to see the actors, but they probably could have cast less famous people and it would've been just as effective. S: She definitely got short-shrifted! I mean, The Killing is a relatively popular show and she was even nominated for an Emmy for it. She has very few lines and very few scenes and isn't given much to do. I would also argue that the Israeli girl, the Mossad agent that joins up with Gerry, is a pretty big role and she's a nobody! Plus she's very underdeveloped. A: That was a big problem with this movie - even Gerry himself is underdeveloped. They try to show you that he's a family man and that this is what he used to do, but for the most part it's just Brad Pitt playing Brad Pitt, traversing the globe trying to stop the zombie outbreak. S: Although...he's not eating anything in this movie. He drinks a soda, that's about it. A: He does drink a pop. And I don't remember him eating any of the pancakes in the first scene, so good call! S: I totally missed that! I thought he was counting to himself in his head! A: And then they bring it back around pretty soon at a point where he thinks he might be infected and stands on the edge of a building and counts to twelve in case he turns into a zombie and he could throw himself off the edge and kill himself. I thought that was a great detail. Or when they're in the grocery store and Mireille Enos is being attacked by a few guys and saves her just as a cop shows up, so Gerry puts his hands up in surrender but then the cop walks right past him to grab baby food and stuff for his family. That's good stuff. S: The part that I missed that I'd like to go back and watch is in the pharmacy when Gerry is looking for asthma medicine for one of his daughters and the pharmacist kind of shows up out of nowhere and asks what he needs. The pharmacist gives him what he asks for then gives him some other stuff, and what does he say? A: The pharmacist tells him that this other medicine works miracles for his kid. A: So yeah, little things like that I really liked. S: In the midst of chaos, that humanity still previals. A: I liked when Gerry gets to South Korea and the soldiers referred to the zombies as "Zekes." I thought that was neat, and I'm assuming that's from the book. That seems like something easy to take from the book. So they call them "Zekes" instead of straight-up calling them zombies, so I liked that. Little details in a zombie outbreak, I thought World War Z did well with things like that. I'll give them credit there as well. The last thing I liked? That they used a Muse song, and very heavily! S: Somebody else did the score, but Muse was originally asked to do the score and couldn't but they still let the movie use one of their songs. Which one was it? S: It's called "The 2nd Law: Isolated System." So yeah, Matthew Bellamy is credited with writing some of the music although it's something they've already done, but the film uses the song A LOT. Almost like a theme throughout the movie. They're my favorite band so I loved hearing that song, and it was relatively effective, too. A: Overall, it was entertaining for the most part. Like I said, I thought the little details were interesting, but I was disappointed when all was said and done. I was left wanting. S: Well it's ends abruptly for me, and I know there's going to be a sequel so they have to leave a little bit to the imagination, and it's not a very long movie in terms of today's movies. But it kind of just ends, so that was a short-coming to me. A: It just wasn't very fulfilling to me. The plane sequence? A: It's very intense. It's definitely the highlight of the movie. S: But it's also the extreme turning point in the film, which wasn't so good. 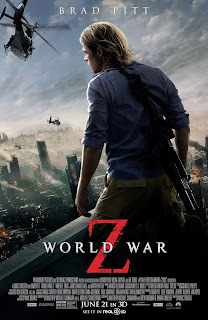 A: So final thoughts on World War Z? S: A good action film for the first hour and a half or so, but the last half hour fell flat and definitely left us wanting more. And personally I don't think you should be laughing during a zombie movie unless it's a comedy like Shaun of the Dead or Zombieland, I think for a zombie movie to be effective I don't think it should be funny. It should be scary, and this one had the audience laughing quite a lot. Definitely more than once. I think it kind of missed the mark here.